How to renew borrowed Library documents? When you sign into LSMU Virtual Library, click the link My Library Card (My Account / Loans). My Account enables you to view the content of your library card and perform library services, such as renewing a book or cancelling a request, fines balance and etc. My Library Card / Loans: check the box, click renwability option, if you want to renew a document. You can extend the return date by yourself via the internet (9 times) if the document hasn′t been requested by another user. Return date for documents marked with green stickers can be extended twice. The readers can return documents by using returning machine on the 1st floor or return in service to readers posts. 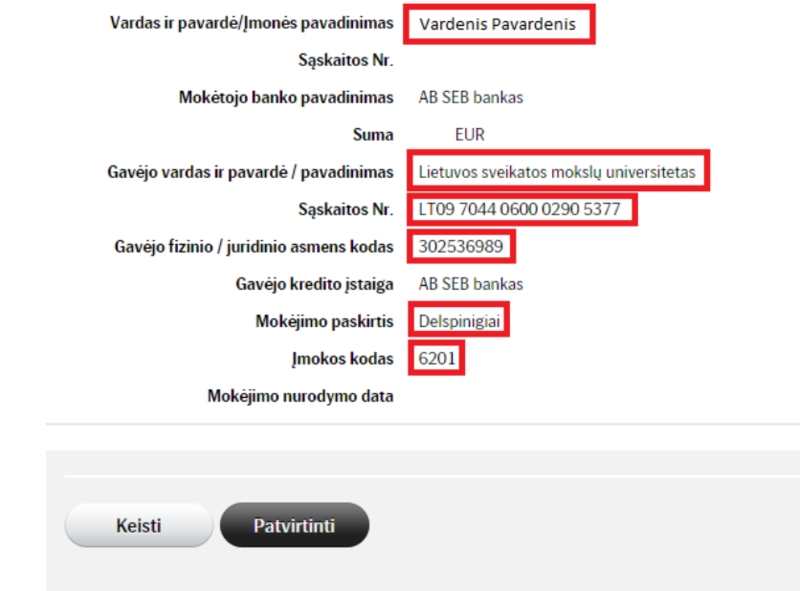 If you will not return documents in time then system will start to calculate money - for one belated day - 0,14 Eur for every publication. If your fines total more than 12 Eur limit, you will need to come into the Library and settle the fines before you can borrow documents. The overdue fine can be paid in installments at the cash register of the library or by wire transfer. How to pay. Does library collect doctoral dissertations and master theses? LSMU Library stores doctoral dissertations in the repository. You can read the electronic versions of Master theses and doctoral dissertations. Why some electronic documents can not be accessed and read in ETD? The access to some electronic documents is limited by the authors of those documents. You will have possibility to read the scientific papers when limited access will end. It depends on particular scientific work. I can not find the cost-free article, but I need it. What can I do? Is it allowed to bring compact disks to home? Yes, but only those discs, on which cover the green sticker is glued up. Don’t forget to return the discs to the librarian, but not by self-service documents return station. I do not know how to search for information in the databases, where could I learn how to do that? Cost-free courses are organized in the library. Is it possible to get access to the subscribed databases at home? Yes. With the help of internet proxy server EZproxy and remote access computer network service VPN. Why it is not possible to read all journals, articles in the databases? Because not all journals are subscribed in the databases. What databases include e-books? Is it possible to read e-books if not connected to the database? Library / Subscribed databases. If you want to download and read e-books in your personal computer or mobile device, then Adobe Digital Edition program has to be installed in it. How to submit the doctoral dissertations and the final papers of Master students to ETD IS? Thesis uploading to eLABa instructions. If tablet pc’s can be borrowed in the library? Yes. Tablet pc’s are for search in the database, for reading full-text databases, for review video and sound material of science and studies. Tablet pc’s service and information is provided in the reading room on the 3rd floor.